With that being said, here is some sweet superkicking horrific wrestling goodness. This article was originally published at Blumhouse.com, April 2017. The best part of being a horror fan is, perhaps, the fact that is often finds itself entangled in so many other avenues of entertainment. Being a fan of the genre means not only being able to absorb it and fall in love with it through cinema but finding it permeating throughout pop culture as a whole. From television to comic books to video games, you can find horror themed home decor, apparel and memorabilia everywhere. Within that “everywhere,” you can find it deeply entrenched in some of the most memorable and storied moments of the biggest sports entertainment phenomena on the planet: WWE. Sure, you may be thinking “what does horror have to do in a place like wrestling?” This entire article was spurred by a recent event that transpired at Wrestlemania 33. If you don’t follow wrestling, a legend known as The Undertaker had his final match, the main event, at Wrestlemania 33 in Orlando. It was this match, and his subsequent "retirement", that spurred the writing of this article. As the man known as “the phenom” laid down his garb in the middle of the ring post match, a realization occurred. The most iconic and legendary wrestler in the history of the WWE had spent the bulk of his career (thanks a lot, “American Badass” era) with a horror themed gimmick. Although he is the greatest, it’s not just him. Across it’s half a century long history, the WWE has created a number of such characters; some played up to the side of campiness while others have leaned into the theme and created some truly fantastic stories. This is an examination of some of those said wrestlers and how they found a way to intersect two niche genres to create something truly magical. Papa Shango, more widely known as The Godfather, was a character that completely tanked when he premiered in 1992 and that wrestling fans have looked back fondly on. He was a voodoo practitioner, with the full regalia, who would walk down the ring with a smoking skull on a chain. Shango initially had control of arena lights so that he could mess with his opponents and as time went on he accrued new abilities: being able to make other wrestlers vomit or bleed uncontrollably. The character never took off, actually voted worst gimmick of the year in 1992, but it’s something that modern day wrestling fans look back at with rose colored glasses, enjoying the campiness of the bit. Debuting in 2005, Boogeyman was a wrestler that was more known for his vignettes and post match antics than his actual wrestling history. A number of backstage shorts were produced that had the Boogeyman, utilizing the popular horror trope of creepy nursery rhymes to paint the wrestler in a maniacal light. After weeks of randomly jump scaring wrestlers backstage, bashing them or himself over the head with giant clocks, and shouting his catchphrase (I’m the Boogeyman, and I’m comin’ to get’cha!) he finally debuted and further delved into the bizarre. He became well known for taking a handful of worms and dirt out of his pockets and either putting them in his own mouth or the mouth of his opponents. As his career dwindled down, he became sillier and sillier but his debut was built as a truly frightening character. Before the peak of the Attitude Era in WWE, Gangrel debuted and was touted as a vampire. Yes, a real life vampire. He would make his entrance on stage in a ring of fire, drink from a goblet full of blood, and spit it into the air allowing speckled blood to stain his victorian style white shirt and drip down his fangs. His name was taken straight from the Vampire: The Masquerade roleplaying series, and once introduced he went on an undefeated tear before introducing two of his minions, Edge and Christian, thus creating The Brood. The Brood were essentially vampires from the wildly successful Blade movies and terrorized the roster for months, often inciting “bloodbaths,” where the lights to the arena would cut out and when they came back on, the opponent was drenched in blood. Eventually, Edge and Christian would split off and become arguably the best tag team of all time and Gangrel would be let go but always remembered for creating a truly memorable experience. Finn Balor is usually just your average super athletic Irishman, but occasionally, he transforms into the Demon King. Steeped in Irish folklore (his name is both the most legendary hero of Irish mythology and the god of blight), Finn Balor only introduces the Demon in times of dire need. With one of the greatest entrances in wrestling history, Balor will paint himself in a number of different ways. As a fan of horror and comic books, he has come out as a demon, a skeleton, Venom and Punisher from Marvel comics, and even Jack the Ripper. Debuting on the main roster last year, he started to delve into the backstory of the character, highlighting the background in Irish mythos, before suffering a year long injury. Now that he’s back and starting a feud with another supernatural themed wrestler, who knows just how dark he will get. In modern wrestling, it doesn’t get more genre themed than Bray Wyatt. Introduced as the leader of a backwoods cult, the eponymous Wyatt Family, Bray draws inspiration from Charles Mansion, Cape Fear, You're Next and more. Often seen wearing sheep masks, the faction would cut backstage promos with Bray promising the defeat and doom of whoever they were feuding with while his family members, Luke Harper and Erick Rowan, would stand lumbering and menacingly behind him. Wyatt quickly gained popularity, becoming stranger in his promos and creating his own mythos. His followers became known as fireflies, with fans lighting cell phone cameras to shine as the Wyatts stroll calmly down to the ring, a lantern as their own source of light. Bray started creating creep catchphrases for the group, encouraging rival wrestlers to “follow the buzzards” or simply “run” in a gravely haunting rasp. A backstory was hinted at that Bray and his family worshipped his now deceased sibling, Sister Abigail. The Wyatt compound was seen in a rivalry against the New Day, an empty muddy field full of broken down cars, discarded tires and surrounded by a menacing forest that was shown to house dozens more of the sheep masking wearing Wyatts. Most recently, Bray Wyatt used his supernatural abilities to create images on the actual mat of the ring at Wrestlemania in his match against former Wyatt member, Randy Orton. Flashing images of cockroaches, worms and other creepy crawlies enveloped the ring the toy with Orton’s head. Even now, Wyatt has a “house of horrors” match schedule with Orton and is developing a rivalry with the Demon King, Finn Balor. Glenn Jacobs had a string of unsuccessful gimmicks in the WWE, including one as a demented dentist named Issac Yankem, before finally landing on the one that would make him of the most celebrated all-stars of all time. Kane was introduced as the brother of The Undertaker. The story goes that Undertaker locked his family, including younger brother Kane, in their family funeral home and burnt it to the ground. After disconnecting with former mentor and manager Paul Bearer, Undertaker had it revealed to him by Paul that his brother Kane had survived, although horribly physically and mentally scarred. 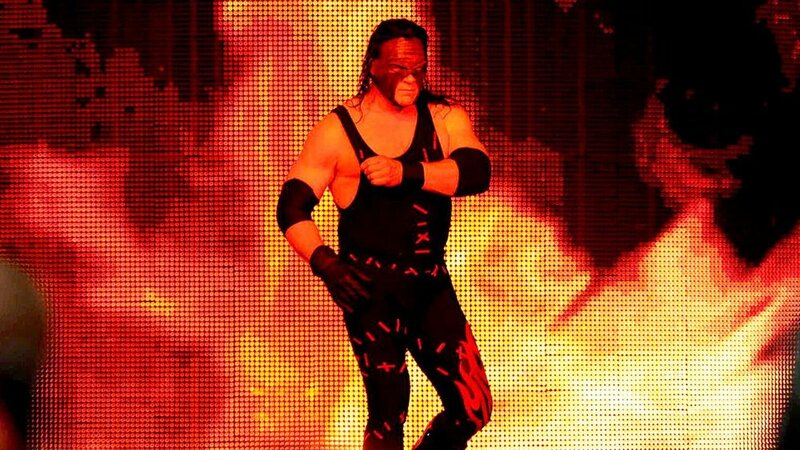 Finally debuting after weeks of build up, Kane came out with a full face mask and red and black flame attire. Having suffered lung damage from smoke inhalation, he at first was a mute and then spoke using a voicebox. He is a scary movie villain if there ever was one. After a series of matches, Kane finally betrayed Undertaker, trapping him in a coffin and lighting in on fire. For the rest of his career, Kane made a name for himself as an intimidating force with a strong tie to the supernatural. He could summon fire, lived under the ring in A Nightmare on Elm Street boiler room sort of hell, and would rip open the mat to drag people to an unknown fate. The man known as The Big Red Monster is one of the greatest horror creations ever produced by the WWE. It would be impossible to tell the full storied career of The Undertaker. It’s no mistake that he has been referred to as “the phenom” for decades, but more than that, he has almost always been known as “the deadman.” After making a strong debut, Undertaker disappeared only to return at Summer Slam and really kicking off the horror themed wrestling. A number of casket matches came to fruition, he originated coming from under the mat, and his finisher is the tombstone piledriver. That’s just his move set. His story is full of crazy horror movie fun. He has led an evil cult, called “The Ministry of Darkness,” that once kidnapped the daughter of the CEO of the company and tied her to a giant cross in the shape of Undertakers symbol to try to force her to wed Undertaker in unholy matrimony. He has had his soul stolen only to reclaim it alongside his brother Kane. He has been known to control electricity, competed in buried alive matches, and would often incite dread by informing opponents that they would indeed “rest in peace.” Horror fans, take solace in knowing that the most infamous wrestler of all time was nestled comfortably right in our favorite genre. Netflix's CARGO reveals first poster and trailer! Can Evrenol's HOUSEWIFE Coming This Fall From RLJE Films!